Def Leppard played a show on the Rock Of Ages tour in St. Paul, MN on 29th July 2005 and an archive concert review is available to read. Pioneer Press reviewed the show which took place at the Midway Stadium. A second online review is available from this show. "That's why they played Friday's night concert at Midway Stadium, in front of about 13,000 ecstatic fans, with confidence, polish and undeniable pop-metal muscle. 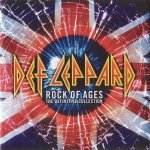 Only lead singer Joe Elliott's voice showed any serious signs of age, but given the unsubtle material - "Let's Get Rocked," "Rock On," "Rocket" - it was easy to forgive."